Graduate student Xiaolong Luo, a Ph.D. student in the Fischell Department of Bioengineering advised by Maryland NanoCenter Director Gary Rubloff (MSE/ECE/ISR), is conducting research on a “lab-on-a-chip” microsystem for drug development that could lead to a new strategy for antibiotic therapy. Antibiotic resistance has been an increasing public health concern. However, few new drugs for bacterial pathogenesis have been obtained without addressing this resistance. One target to solve the arduous problem is "quorum sensing" (QS), a newly-discovered communication system among bacterial cells. In QS, bacterial cell communication is mediated by chemical signals that, when the number of cells reaches a "quorum" level, coordinate changes in gene regulation. The capability to intercept and rewire the biosynthesis of signal molecules, and not kill the bacteria directly, opens the door to discover novel antimicrobial drugs that are able to bypass antibiotic resistance. 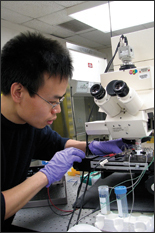 Luo's research focuses on developing a microscopic drug research platform that can be used to test potential drugs. By placing QS enzymes in a well-controlled microsystem, the communication signal molecules are reproduced and can be further interrogated. Enzymes placed in site-specific locations in the microsystem have shown normal activity. Next, the microscopic platform is used to screen efficient inhibitors, ultimately the antimicrobial drug candidates, to knock down the production of signal molecules for bacterial communication. Luo, together with collaborators, has demonstrated a unique platform that integrates biologically active enzymes with microfabricated devices. The enabling capability comes from a biological substance, chitosan. Chitosan can be deposited onto the inorganic surface of microdevices per electrical signal, while retaining reactivity to biological components. The demonstrated platform in Luo's research represents an important step in progress toward a "lab-on-a-chip" technology suitable to support drug development and metabolic engineering research.